It’s going to be difficult to review this book without revealing too much. Our MC, Eve has lived an interesting, yet abusive life and as the book progresses we find out just how hard things have been on her. With the help of her best friend, Eve runs away from her home and gets a job as a roadie for a band known as Bus Stop. West is the lead singer of Bus Stop and an absolute delight of a character! I adored his patience, his kindness and the strength he showed with Eve; things weren’t always easy but the way he treated her melted my heart. With books like this comes secrets and deceit, not always intentional but needed and along with it there is drama; I felt so sorry for Eve, my heart broke for her but her determination and courage was wonderful but we also saw her fear and her distress; as the book progresses you really see a positive change in her character, she went from strength to strength and this was thanks to her best friend and West. We see slow development of romance between Eve and West, their lives couldn’t be more different but they interacted well and had a sweet friendship and eventual relationship that was filled with many mushy moments, you couldn’t help but hope for a happy ever after for them both. Shannon Greenland’s writing is crisp and engaging, I was hooked on this wonderful book from the very first page, I wanted to know what was going on with Eve, who the mysterious person was that she was hiding from and why and of course what the outcome would be. This book tugs at the heart strings, there is mention of abuse but there is also a lot of hope, it was an empowering read that I thoroughly enjoyed. 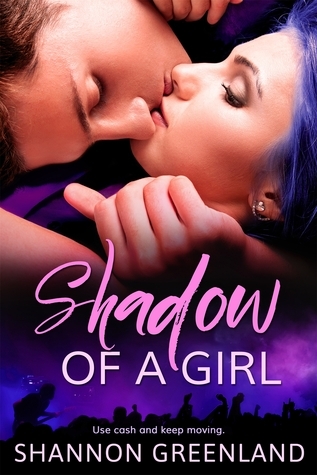 Thank you to Entangled Teen via Netgalley for the opportunity to read and review Shadow of a Girl.